Both in our time in Saigon and Hanoi, we were amazed at how many places were multi-purpose. For example many of the hotels in both cities also had restaurants, tour companies, internet service, etc. Although some of these can handle the various services at a decent level, most really fall short. Our initial discussions with a few of the "better" places left us very unexcited about being part of a "small" group of 15 for a few days. By sheer luck, we walked by Ethnic Travel. We were both surprised and relieved to be someplace where we weren't immediately being pressed into purchasing a tour right then and there. And after some discussion as to their desire to have small (2-6 person) groups and commitment to eco-tourism and we were sold. 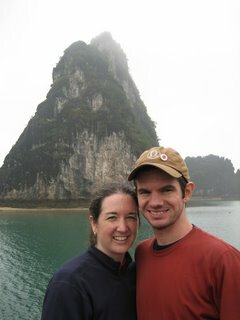 We were also fortunate to have met someone who'd just returned from another one of their trips and was headed out the next day to Bai Tu Long Bay. As this was one of our major interest points for a tour, we discussed it a bit and then signed up with our new English friends Helen and Steffan and were off and running. Many people are familiar with Halong Bay, a major natural tourist destination in northern Vietnam, complete with huge limestone karsts. And most of the tours offered take you around all the famous spots, usually on replica ancient Chinese Junks. Although that might have made a perfectly fine trip, we were excited about exploring east of there into Bai Tu Long Bay as it sounded like the tourism factor was much lower. Although the weather over the two days was a bit below average (think grey and drizzly the entire time), the experience was outstanding. After our 4 hour drive out to Halong city and a tasty lunch (accentuated by the gentlemen pounding shots of Bordeaux at the table next to us) we headed out on a hired local point into the bay. Over the next three hours, except for the occasional fishing boat, we had the entire bay to ourselves. An eerie setting, with the mist and fog but just breathtaking views. We arrived at Van Don Island quite wet (especially Steffan, who had taken advantage of the clear water to go for a swim mid-cruise) but ready to spend some time with the locals. Our fearless tour guide Manh served as interpreter and expert spring roll teacher for the evening. We had the opportunity to spend some time talking with the grandfather of the family while learning how to hand roll fried spring rolls. The next morning brought a 18km ride from one end of the island to the other where we were to meet the boat to head back to civilization. The ride was nice and we had a dog tag along the entire way. We named him Gaa (which phonetically with different tones can mean fish, chicken and pickle) and he stood his own amongst a variety of other dogs along the way. Upon our arrival to the dock though we had an interesting experience. We pulled up to see these men burying jellyfish. After a bit of looking around and some translation by Manh, we found out that they were being harvested for their bodies (the part that hangs down under the bell). The bodies are salted and then sold to the Chinese as a delicacy. Mmm... salted jellyfish pieces. Remind me not to try that one while we're there. As a final crowning touch to the experience, we were treated to a world class fresh seafood meal on our way back to Halong courtesy of the crew on the boat . Just tasty fresh food that warmed us up for our trip home. And the nicest thing of all? Other than Helen and Steffan we saw zero other tourists the entire trip. Needless to say that by the time we'd gotten back to Hanoi we were already ready to see what Manh and Ethnic Travel had to offer us in NW Vietnam.